This 300 large piece jigsaw puzzle is designed by Joseph Burgess and measures 46cm x 61cm. Available in two piece count. This 1000 piece jigsaw is designed by Larry Jones and measures 51cm x 69cm. Available in two sizes. 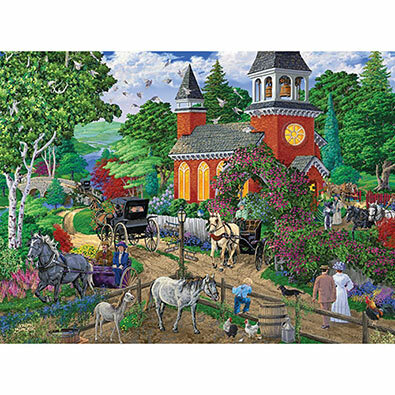 This 1000 piece jigsaw puzzle is designed by Joseph Burgess and measures 51cm x 69cm. Available in two piece count. The Party Crasher is a 1000 piece jigsaw puzzle designed by artist Amy Rosenberg. A fluffy cat lounges on a snow covered tree branch seemingly unaffected by the numerous birds surrounding her. Available in two-piece counts. The Party Crasher is a 300 piece jigsaw puzzle designed by artist Amy Rosenberg. A fluffy cat lounges on a snow covered tree branch seemingly unaffected by the numerous birds surrounding her. Available in two-piece counts. This 300 large piece jigsaw is designed by Gerald Newton and measures 46cm x 61cm. Available in two sizes.